Palermo is the capital city of Italy's main island of Sicily. It's located on the northern coast of the island and has many sights and attractions for visitors. There are several great hostels and budget hotels in the area. This is a fascinating place to visit that offers a glimpse of authenticity in an otherwise touristy country. 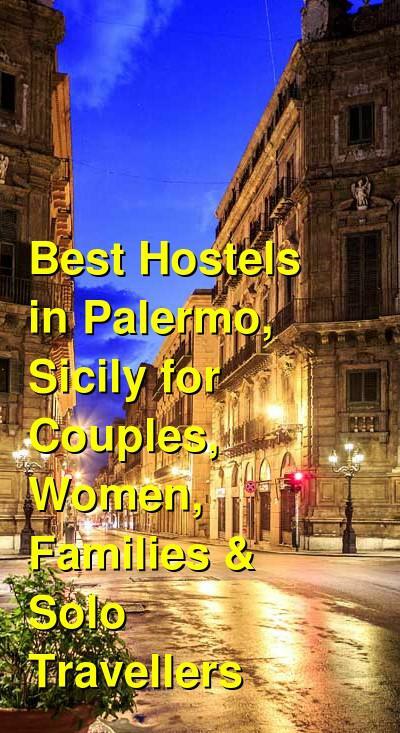 How much do hostels in Palermo cost? Al Vucciria Hostel is a family run hostel in Palermo. It's located in a large and comfortable house in the heart of the historic center. It's close to the ocean, Marina Square, and many different monuments, gardens, and museums and it makes an excellent base for exploring the city. The hostel sleeps up to ten people in two rooms. A four bed room is located on the first floor with a shared bathroom and a six bed room is on the second floor. The six bed room has a private bathroom and a private balcony. The hostel has several great amenities for guests including air conditioning, heating, wi-fi, and a shared kitchen. Guests are also provided with private lockers and breakfast is provided every morning and is included in the price of the room. There are several common areas as well including a terrace and a living room. A good hostel for solo travellers, couples, and female travellers. A Casa di Amici Hostel is a small but comfortable hostel in the center of Palermo. It's located in a detached 19th century building that was renovated in 2013. 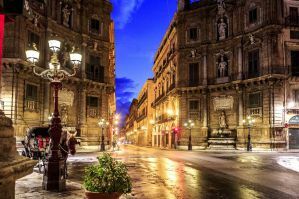 The hostel is located in the Liberty-style part of Palermo and it's possible to walk around the area which has many restaurants, shops, and clubs. It's also close to Politeama Theatre, Zisa Castle, Catacombs, the Cathedral, and several parks. Public transportation is also easily accessible. The hostel has rooms that are split between the first and second floors. The first floor has female only, male only, and co-ed dorms. The is also a double and a quadruple room with shared bathrooms. The second floor has five bedrooms with private attached bathrooms and a junior suite that has it's own television. All of the standard amenities are available through the hostel including air conditioning and wi-fi. There's also a full kitchen which guests can use and a nice common area with a television. There's also an outdoor terrace and barbecue. A good hostel for solo and female travellers. On the Way Hostel is located in a 19th century building in the historical heart of the city. The hostel has the vibe of a hotel more than a hostel, but the atmosphere is charming and the cost is very reasonable. The rooms are spread across the first and second floors and both private rooms and dorms are available. Guests also have access to a shared kitchen, free wi-fi, and an on-site pub that serves several great dishes and drinks. The hostel is centrally located about a five minute walk from the central train, bus and tram station. It's also steps away from a supermarket, many restaurants, and pubs. The hostel offers guests a free breakfast and lunch and dinner are available on request for an additional charge. Private rooms are twins with shared bathrooms. Dorms sleep four, six or eight guests. Both mixed and female only rooms are available. A family run hostel that's great for solo travellers and couples. Mondello Home Hostel is a family run hostel that's located a few minutes outside of Palermo in Mondello. This area is famous for it's beautiful beaches and it makes a pleasant place to spend a few days. There are two co-ed dorms available, one which sleeps six people and one that sleeps four people. There's also a female only dorm with four beds. The one private room is a double. The hostel also has a nice living room, a full shared kitchen, and a nice garden. The garden offers a great space where you can relax or barbecue. There's a homemade breakfast prepared every morning that makes use of traditional Sicilian flavors and cuisine. The hostel owners are wonderful and welcoming. You will quickly feel right at home in this small but charming hostel.